Even if you have a stick, upright, canister or robot vacuum cleaner, there are definitely some places it won’t reach. That’s why you need to have a lightweight, handheld vacuum cleaner to make your work easier. Today, we review the Top 10 Best Handheld Vacuum Cleaners you can buy this year. The fact that handheld vacuums (sometimes called dustbusters) are quite small in size compared to others makes them easier to store. If you live in a small apartment or an RV, a handheld vacuum is ideal for you. After use, you just need to stick it somewhere in a corner or even inside a cabinet. Also, most handheld vacuums weigh just a few pounds. So, you can easily move them around from room to room. Moving a handheld vacuum upstairs is also a walk in the park. You no longer need to worry about pulling a heavy vacuum with the risk of falling over. Being so small and light, they are a perfect fit for the elderly or sickly people. Also, if you need help from your kids once in a while, they’ll actually love using a handheld vacuum. With a handheld vacuum, you can clean almost any kind of dirt anywhere in your home by using the right attachment. For example, it will be quite easy to clean car seats or your seats’ cushions using a crevice tool. The tool helps you get rid of all kind of dirt stuck in those narrow spaces between the back of the seat and the cushion. Also, if you want to clean blinds, ceilings, hardwood floors, or get rid of dust from your shelves, just use a soft-tip brush tool with an extension hose. As you can see, you can do a lot with a handheld vacuum to clean those hard-to-reach areas in your home. Despite the small size, handheld vacuums are quite strong comparatively. While suction power varies depending on the model, most handheld vacuums will easily pick up dirt without having to vacuum the same place for long periods. Any of the top 10 best handheld vacuums we picked for you will definitely be powerful enough to justify your spend. Unlike the more complex models, handheld vacuums are quite easy to maintain. The main reason is that you don’t need to buy extra accessories. Also, most of them are bagless. This means that you don’t need to buy extra bags. All you need to do once t is full is to empty the dirt into the trash can or rubbish pit. If anyone in the house suffers from allergies, it is advisable to empty it outside to avoid allergens getting back into the house. Most handheld vacuums are quite affordable. If you cannot afford that canister vacuum at the moment, just get one of these and you’ll be sorted out. Most handheld vacuums cost less than 100 bucks. In fact, there are some great options that cost less than 30 bucks, for example, the Bissell 33A1 Pet Hair Eraser. 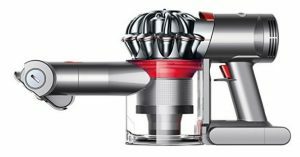 In our review, only the Dyson V7 Trigger and the BLACK+DECKER BDH2020FLFH cost over 100 dollars. They are a bit expensive, but of course, the manufacturers have a proper justification for that as you will see in their individual reviews. There are many hand vacuums on the market today. Some are corded while others are cordless. Whereas with a cordless handheld vacuum it is easier to move from room to room without the inconvenience of dealing with cords, corded handheld vacuums have an advantage. You don’t have to pre-charge before cleaning. Just plug into the nearest power socket and you are good to go. This affordable handheld has become a household favorite. Not only does it come from one of the world’s leading appliance manufacturers, it also has amazing features that make it stand out from the rest. 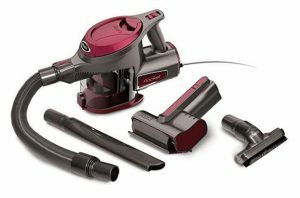 It is no wonder that it is our top pick as the best handheld vacuum and the best cordless handheld vacuum. Apart from being small, lightweight and easily portable, it has much more to offer. First, the BLACK+DECKER CHV1410L has a long lifespan. So, you are not going to buy something that will need replacement in a few months. Once you charge it, its lithium-ion battery can hold a charge for up to 18 months when off the charger. Amazing, isn’t it? You just need to hook it up on the fast-charging countertop base for 4 hours only. Also, the vacuum uses the Smart Charge Technology lithium-ion charger that protects the equipment from damage. Once full, the charger automatically switches off. You no longer have to worry if the vacuum is full because it has a translucent, bagless, washable dirt bowl. The fact that it is bagless means that you don’t need to buy loads of bags. Instead, once it is full, just empty the content into the trash, wash it and it will be ready for the next cleaning job. Another strong feature is its strong suction power. The vacuum employs Cyclonic Action to spin dirt away from the filter. This keeps suction strong to help you clean an array of areas ranging from carpets to ceramic tiles to furniture. To help clean the various areas, this hand vacuum also comes with a brush and crevice tool. For its price, it definitely exceeds expectations in terms of performance. Click here to see how much the BLACK+DECKER CHV1410L handheld vacuum costs. Shark vacuums are among the best in the market currently. These range from stick vacuums to canister vacuums to robot vacuums. In the category of handheld vacuums, Shark has not been left behind. A couple of the company’s hand vacuums stake a claim to spots in our top 10 best handheld vacuum picks. The Shark Rocket HV292 is a fantastic option for various reasons. First, at just under 4 pounds in total weight, this vacuum is ultra-light, making it easily portable. So if you need to clean several rooms, there will be no hassle. It is ideal for above-the-floor surfaces, car interiors and stairs. Another attractive feature is the 15-foot long power cord. This means that whenever you want to clean a certain room, just plug into the nearest power socket. You neither need to keep recharging nor plugging and unplugging as you move along the room. The vacuum comes with a TruePet Motorized Brush that has powerful suction that guarantees deep cleaning. The brush helps extract pet hair, dirt, dust as well as allergens from upholstery. As you clean, you are assured of constant suction power until you are through. Other accessories include a crevice tool, a dusting brush, and a stretch hose. When you are done cleaning, the dust cup is among the easiest to empty. You can easily empty the dirt into the trash at just a press of a button. 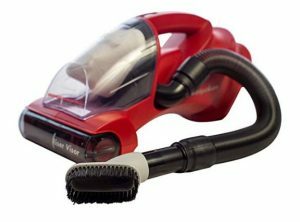 Click here to see the current price of the Shark Rocket HV292 handheld vacuum. While most handheld vacuums are great with pet hair, the Bissell 33A1 Pet Hair Eraser is the most ideal, especially if you are under a tight budget. At around 30 bucks, this lightweight vacuum will give you true value for money. With a power rating of 4 Amps, this easily portable handheld vacuum will help you clean upholstery, car interiors and stairs using a rubber contour nozzle. It also has a hard nozzle that helps pick up dry messes like cat litter, pet food and the like. This makes your clean-up job easier. To change the nozzle depending on the task, just press down the round nozzle-release button and snap in the new nozzle. Thanks to a 16-foot long power cord, you don’t need to keep on shifting from one power socket to the next. You can comfortably clean the whole room from a single charge-point. Lastly, if there are any people suffering from allergies in the house, the Bissell 33A1 has a solution. It uses a multi-level filtration system to get rid of allergens from the air, making it cleaner. 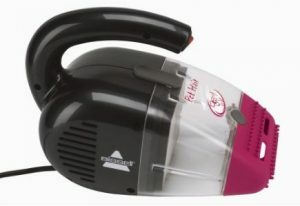 Click here to see the current price of the Bissell 33A1 Pet Hair Eraser. Dyson is one of the world’s leading manufacturers of vacuum cleaners in the world. The range of vacuums includes stick vacuums, canister vacuums, upright vacuums and handheld vacuums. Among the various handheld vacuums by Dyson, the V7 Trigger stands out. The Dyson V7 trigger has one of the strongest suction powers in the cordless handheld vacuum category. This remarkable power is provided by the Dyson digital motor V7. Also, the lithium ion-batteries ensure that the vacuum lasts up to 30 minutes without fading on a full charge. Another feature is the use of the Cyclonic Cleaning System. 15 cyclones help in capturing fine dust and microscopic particles as tiny as 0.5 microns. This should help you easily clean upholstery, stairs, and even car interiors. When it comes to emptying the vacuum once full, worry not. As expected of any good hand vacuum, you don’t need to touch the dirt. At the push of a button, the hygienic dirt ejector pushes out the trapped dirt into the trash can. The Dyson V7 Trigger also comes with an array of useful accessories. First, a mini motorized tool helps remove pet hair and ground-in dirt. Secondly, a combination tool can be used for gentle dusting in the house or in the car. Lastly, a crevice tool reaches any dirt hidden in crevices and awkward gaps. Click here to see how much the Dyson V7 Trigger costs currently. This is another BLACK+DECKER masterpiece. The BDH2020FLFH is ultra-compact, ultra-light portable hand vacuum that gets rid of dirt various kinds of spaces, thanks to its versatility. Apart from using it as a conventional handheld vacuum, you can also use it for bigger cleaning jobs. Simply attach the stick vacuum floor head and you have yourself a stick vacuum. Apart from the stick vacuum floor head, the BDH2020FLFH also comes with other useful accessories for different purposes. For example, a rubberized pet hair brush makes it easy to get rid of cat or dog hair. On the other hand, a 4-foot, flexible extension hose allows you clean from the floor to the ceiling with ease. Other attachments include a crevice tool and a flip-up dusting brush. The vacuum uses cyclonic action to spin dirt away from the filter. This helps to maintain constant high performance during the cleaning process. The superb performance throughout the vacuum process is also aided by a long-lasting lithium-ion battery. Since it is bagless, this BLACK+DECKER vacuum has a washable dirt bowl that is easy to empty into the trash can. Also, to ensure that allergens do not sneak back into the air, the vacuum employs a 3-stage filtration system. Therefore, it is ideal if you are battling allergies. The filter is also washable. Apart from cleaning various items and areas inside the house, this handheld vacuum can be used effectively to clean car interiors. 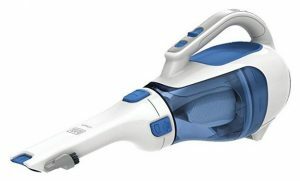 The vacuum is quite similar to the BLACK+DECKER BDH2020FL which is also worth a look. However, the BDH2020FL doesn’t come with a stick vacuum floor head. 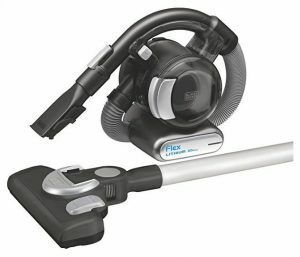 Click here to see the current price of the BLACK+DECKER BDH2020FLFH Flex Vacuum. The Eureka EasyClean 72A is another great handheld vacuum to help you get rid of different types of dirt in your home. This vacuum makes it to the top 10 best handheld vacuum cleaners list due to its attractive features that vindicate its popularity in households. First, it has powerful suction that allows it to easily pick up dirt from upholstery and carpets with ease. It can also clean stairs and any vertical upholstery effectively. Even if the stairs are carpeted, the Riser Visor tool comes in handy. In addition, put in to work on different floor types and you won’t be disappointed. With or without the roller brush, the Eureka EasyClean 72A works perfectly on laminate, hardwood, tile or vinyl floors. Then, the vacuum works well to clean spills from tables, countertops and other above-floor surfaces. It is also ideal when you want to vacuum your car’s interior and get those hard to reach particles. This is all possible because it has a crevice tool. Because it has a long power cord, your work when cleaning a room is easier. You don’t need to keep moving from one charge-point to the other. The power cord is 20 feet long. Click here to see the current place of the Eureka EasyClean 72A. 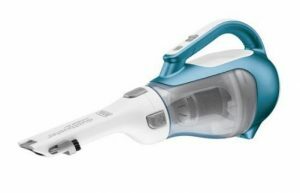 Just the other BLACK+DECKER handheld vacuums reviewed above, the BDH2000PL Pivot uses Lithium Technology. This is the basis of the strong 35 Air Watts suction power that it can maintain at a constant level until you finish cleaning. Also, the vacuum uses cyclonic action to keep dirt away from the filter so as to maintain the powerful suction. The 20V max lithium-ion battery gives you a longer cleaning duration. The vacuum is charged using an upright charging base that comes as part of the package. The charging base can also be used as a convenient storage for the vacuum. Weighing just 3 pounds, this lightweight, cordless handheld vacuum helps you clean from room to room with ease. Apart from small dust particles, its wide mouth can scoop even large debris. If there is anyone in the household who suffers from allergies, the washable filter comes in handy. The vacuum also uses a 3-stage filtration system to keep allergens at bay. As the name suggests, the vacuum has a pivoting nozzle which makes it easy to adjust its position. So, cleaning those hard-to-reach places like cupboards, under the seats or on top of shelves becomes easier. 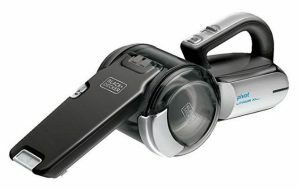 Click here to find out the current price of the BLACK+DECKER Platinum BDH2000PL Pivot Vacuum. 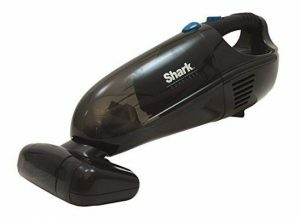 We have already looked at the Shark Rocket Corded Hand Vacuum (HV292). However, there are some Shark fans who love cordless hand vacuums. Here is your solution. The Shark Cordless Handheld Vacuum Cleaner does not disappoint both in terms of performance and additional features that make your tasks easier. It is perfect for homes, boats, cars, and RVs. The vacuum is powered by a lithium-ion battery, meaning that it’s going to give you strong suction throughout the cleaning task. Even though it is compact, lightweight and easily portable, this vacuum has an XL capacity. So, you don’t have to keep emptying after every few minutes. Also, the vacuum has a variety of attachments to help you clean all types of surfaces. First, a detachable XL motorized pet hair brush helps you remove pet hair and dirt from couches, carpets, upholstery, car mats and much more. Then, a crevice tool is available when cleaning those hard-to-reach areas. Lastly, a dusting brush enhances the vacuum’s versatility. Click here to see how much this Shark Cordless Handheld Vacuum costs. Finally, we have the last BLACK+DECKER handheld vacuum in our top 10 best handheld vacuum cleaners list. The fact that we have quite a number appearing here is a testament to the kind of work that has gone into making these dustbusters. The quality is simply impeccable. 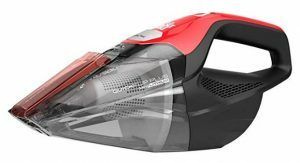 It uses a lithium-ion battery that is key in providing a strong 16 Air Watts suction. It also employs cyclonic action that prevents dirt from sticking to the filter. This helps maintain the suction strong until you finish the task. The dirt bowl on the HHVI320JR02 is translucent so that you can know when to empty the dirt into the trash. The bowl is also easy to clean. Also, once you are done the cleaning, storage is a no-brainer. Just place it on the wall mount that is included in the package. This hand vacuum also has an array of useful attachments to help you clean various areas in your home, garage, car or boat. There is an extendable crevice tool which helps you to access those hard-to-reach spaces. In addition, a flip-up brush helps you vacuum upholstery effectively. A rotating nozzle also helps you hold the vacuum comfortably as you target the dirt in hidden areas. Click here to see the current price of the BLACK+DECKER HHVI320JR02. This small vacuum is perfect for small cleaning jobs because it doesn’t have a very big capacity. However, it has a very easy to empty dirt cup. So, you can empty it as many times as you want as you cover more ground in your home. Its compact size also makes it very easy to carry around and store as well. The vacuum’s 16-Volt lithium-ion battery also gives you a considerably long cleaning time. A power indicator is available to notify you when it’s time for a re-charge. The Dirt Devil Quick Flip Plus also charges 2 times faster than most dustbusters. This vacuum has a couple of attachments to ease your work as you clan various surfaces. A quick-to-attach powered turbo tool allows you to clean stairs and upholstery effectively. Also available is a crevice tool that flips out to help you get dirt hidden in hard-to-reach spots. Click here to see the current price of the Dirt Devil Quick Flip Plus BD30025B. When looking for the best dustbuster to get rid of dirt from your home, car, RV, garage or boat, it can be quite tasking to go through hundreds of products and reviews. Thankfully, we have taken that burden off your back. After analyzing numerous hand vacuums, we have simplified the work for you. Any of the vacuums listed in this article will surely give you value for money. The aim is not only to clean, but also to do an exemplary job in the shortest time possible. We thought to include both cordless and corded handheld vacuums in the same article so that you can understand all your options in one sitting. If you have any feedback on the article, feel free to let us know in the comments section below. You can watch this YouTube video on Cleaning Filters for BLACK+DECKER Hand Vacuums, by BLACK+DECKER.